KINSTON, NC (WTVD) -- Authorities in Kinston are still searching for two suspects in connection with the fatal shooting of an 18-year-old man Sunday evening. The incident started around 5:13 p.m. when police officers received a call about shots being fired in Bill Faye Park. When officers arrived, they found a teenager who had been shot multiple times in the 1200 block of Lynn Drive near Westside FWB Church. The victim, 18-year-old Antonio Lorenzo Hines of Kinston, was pronounced dead at the scene. The Kinston Police Department said witnesses described seeing a white two-tone older model Buick sedan fleeing the scene. They also said there were several suspects inside the car. Early Monday morning, police arrested 18-year-old Thomas Maurice Bullock and 17-year-old Tyrek Rashaad Leach in connection with Hines' death. 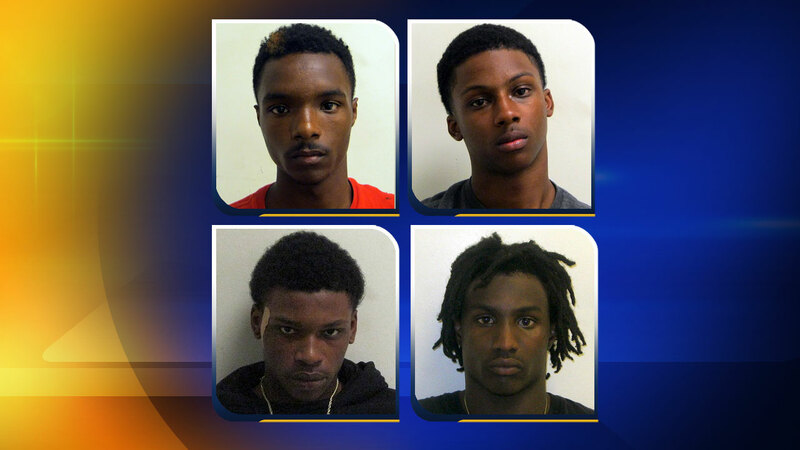 They have been placed in the Lenoir County Jail under no bond. Officials are still searching for 20-year-old Jaquel Daquan Lawson and 19-year-old Christopher Daquonne Hembry in connection with the crime. Police have issued arrest warrants against the pair for murder. If anyone has information on the location of Lawson and Hembry, they are asked to call the Kinston Police Department at (252) 939-3160, The TIPS Line at (252) 939-4020, or Lenoir County Crime Stoppers at (252) 523-4444.